A while ago, I picked up a half-size bottle of Mathilde brand cassis (black currant) liqueur. Often referred to with some pretension as “creme de cassis” in recipes, the distinction between creme de cassis and just plain cassis seems vague at best. Anyhow, though extremely sweet, my plain old cassis had a nice flavor and I decided it was time to give it a whirl in an appropriate cocktail setting. Also known as the Paris Cocktail, the Parisian shows up in the 1930 The Savoy Cocktail Book and Dale DeGroff’s much more recent The Craft of the Cocktail. However, a 2009 Savoy Stomp blog post by Erik Ellestad traces the drink to a slightly earlier 1929 recipe published by Harry MacElhone. He’s the “Harry” of Paris’s famed Harry’s New York Bar, so I guess this drink might actually be consumed by actual Parisians. French cocktailing bonafides or not, I did find the original recipe a bit overly sweet. So, partly by accident and partly inspired by the slight monkeying with the recipe Mr. Ellestad performed, I came up with a version I prefer. It’s a bit lighter and more refreshing — and still plenty sweet; almost a high end gin and juice, if you will, even if this version has more vermouth than gin. Combine your liquids in a cocktail shaker with plenty of ice. Since cassis is so fruity, the cocktail gods seem to agree that this drink demands to be shaken. Do so vigorously. Strain into a chilled cocktail glass and, I say, add a traditional twist of lemon to cut the sweetness just a bit. As for your toast, toast Paris, of course. People who’ve been there say it’s amazing and the rest of us have the dreams of Paris we get from the movies and what not. That’s pretty okay, too. Since I only have one brand of cassis and dry vermouth on hand, I didn’t get to play around with different brands as much as I might have. However, I did find that this version of the Parisian works very nicely with either Bombay Dry Gin or the very inexpensive, but still quite decent, Gordon’s Gin. The latter variation especially reminded me of a classier, more drinkable version of the first alcoholic beverage I ever consumed. 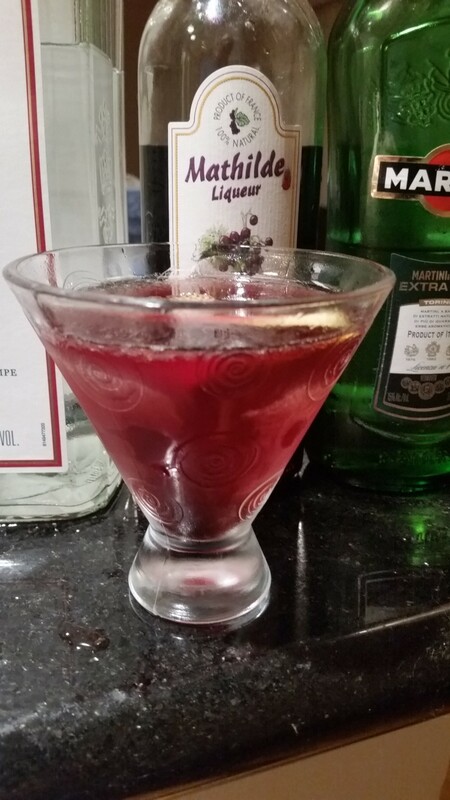 Yes, if you were ever wondering what Manischewitz Concord Grape would taste like if it were actually good, the Parisian Cocktail is close as you’re likely to get. And Paris, Las Vegas is as close to Paris as I’m likely to get any time soon. C’est la vie. Never fear, absolutely no simians were harmed in the making of today’s DOTW. The Monkey Gland is, in fact, a sly wink to a prohibition-era alleged health treatment which, for a time, was seriously in vogue with the (maybe not so) smart set. It did, in fact, call for the transplantation or grafting of the testicular tissue of a presumably very unhappy primate onto the testicular tissue of a slightly less unhappy primate, i.e., a male human being. Say what you will about modern day snake oil supplements and the like, they rarely cause intense groin pain. What drew me to today’s cocktail was not any interest in the potency properties of primate parts, but in finding another drink where I could substitute my new bottle of raspberry syrup for grenadine after last week’s adventure with Dr. Cocktail’s Blinker. I admit to having enough of a sweet tooth that I was contemplating using my Smucker’s syrup in lieu of jam by soaking pieces of bread with it. Better by far to use a much smaller amount of it as a sweetener in a drink I’m going to be consuming anyway. That’s not to say I didn’t give a fair hearing to the more traditional choice of grenadine, but let’s just say I was prejudiced in favor of the old school substitution. Combine all your liquid ingredients in a cocktail shaker, perhaps stirring first if your using the kind of thick, cold raspberry syrup I was. Shake for a good, long time and strain into chilled cocktail glass or coupe. Add your orange peel and toast our much maligned cousins in the animal kingdom. Yes, we are related to them. Admit it, you resemble monkeys and apes at least as much as you resemble your uncle who always smells vaguely of fried eggs. 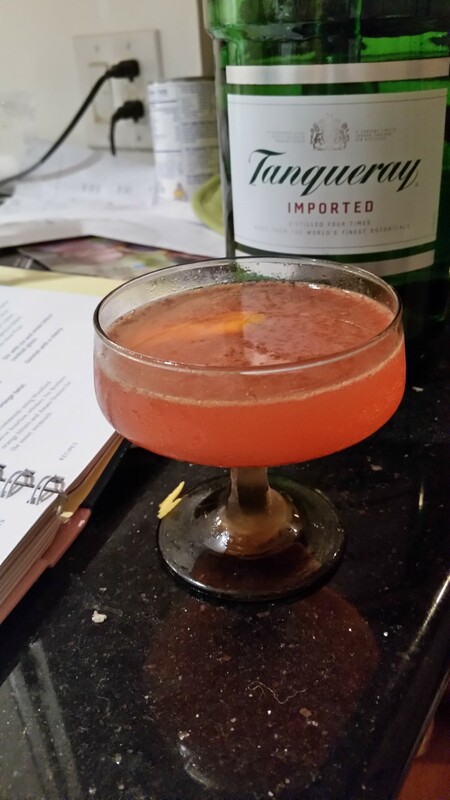 This version of the Monkey Gland comes to us primarily from cocktail super-maven Robert Hess, who — and I mean this in the most flattering way possible — has always struck me as Martha Stewart’s boozier, slightly more relaxed twin brother. The drink in its updated version appears in Hess’s truly essential The Essential Bartender’s Guide, as well as in one of Mr. Hess’s eminently watchable online videos. It’s creation is usually credited to Harry MacElhone of Paris’s legendary Harry’s Bar. Mr. Hess, however, says the Monkey Gland was first mixed by Frank Meyer, the almost as legendary bartender at the nearby Hotel Ritz. The original Monkey Gland called for equal parts gin and orange juice and commensurately less sweetener. I was tempted to give that a try but then I wouldn’t be using so much of my raspberry syrup up, and we couldn’t have that. Also, I’ve been enjoying my bottle of Tanqueray and who needs to cover that colossus of London gins up with too much OJ? Nevertheless, I did also try this drink with cheaper, merely 80 proof, Gordon’s Gin, and it was a taste treat in it’s own right. The difference was actually more pronounced between the Monkey Glands I made using my default Master of Mixes grenadine and the raspberry syrup. It produced a gentler, subtler, slightly sweet taste I really enjoyed, especially when paired with the a-little-goes-a-super-long-way annis/licorice flavor of absinthe. So, yes, once again, advantage Smuckers. And one final note, there’s also a South African barbecue sauce which goes by the name of Monkey Gland. It’s also 100% primate free but also contains no gin. You win some, you lose some.